Ole Gunnar Solskjaer has challenged Paul Pogba to "put his stamp" on Wednesday's Champions League quarter-final against Barcelona after dismissing talk of the mercurial midfielder leaving Manchester United this summer. 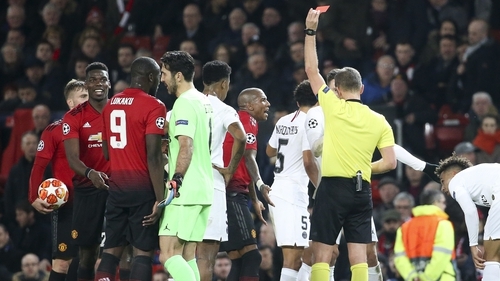 Five years on from their last appearance in the last eight of European football's top competition, United play host to the five-time champions in an eagerly-anticipated first leg. Speaking ahead of the Champions League quarter-final clash with the Catalans, Solskjaer said: "Paul is looking forward to tomorrow. He's a Manchester United player. He's one of our, of course, big performers on the big stage. "He knows the game against PSG was not his greatest moment so he is only focused on playing well tomorrow against Barcelona and I cannot see him not playing for Man United next season either." Solskjaer is hopeful Marcus Rashford will be available for the crucial clash. The forward started yesterday morning's training session doing individual work following an ankle injury, raising question marks over his participation. But Solskjaer told a pre-match press conference: "He needed the extra warm-up and hopefully he won't get a reaction. He joined parts of it (training) at the end. Let's see tomorrow. Hopefully he'll be ready." Solskjaer confirmed Eric Bailly and Antonio Valencia would miss the game but revealed Nemanja Matic could be available, while Ander Herrera was likely to miss out. All four players, who, like Rashford, missed last week's Premier League loss to Wolves, were absent from the open part of training. "We still hope maybe that Nemanja can be ready, Ander is probably out and Eric and Antonio are definitely out," Solskjaer added. Solskjaer acknowledged stopping Barcelona forward Lionel Messi will not be straightforward but said it is not impossible. "What kind of plan can you have to stop one of the best players in the world? We're looking forward to it and relishing the opportunity but this season we've played against Juventus and (Cristiano) Ronaldo, PSG with (Kylian) Mbappe, we've had (Eden) Hazard. "(Luis) Suarez as well. Suarez, (Philippe) Coutinho and Messi will keep our defenders on their toes so let's see how we manage tomorrow. "Messi will be difficult to stop but it's never impossible. It's not like it's Messi against Manchester United. There are so many good players, we can't just focus on one player. "When you get a Barcelona - with the history and traditions of that club, the quality of their team and individuals - we know we need to step up our game. "We know we need to perform at our best level, which we didn't against PSG in the home game. "But I think the outcome of the second leg has given players belief, supporters belief that it is possible against a Barcelona team as well."